Finally, after a lot of talking, planning, drawing and then talking again, we are moving from the theory stage to the practical. OK, there have been a few, smaller odd-jobs around the house. But now we have the electrician, plumber and builder hard at work, renovating the house and creating the spaces we wanted. oval windows (called oeuil de boeuf) in the outside wall to give light, as well as replace the old doors and frames. Then the units, work surfaces, shelves and lighting will be put in. fill with concrete and finish with a parquet floor. bathrooms upstairs, as well as Caroline's study. Here are a few photos of the work in progress over the last two months. 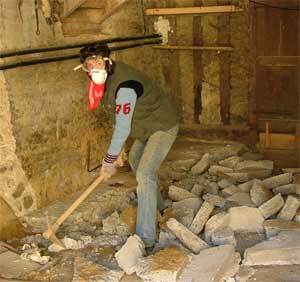 Perry drilling out the old cement in the chai, before the digger arrives to level the floor out at 25cms below its present level. 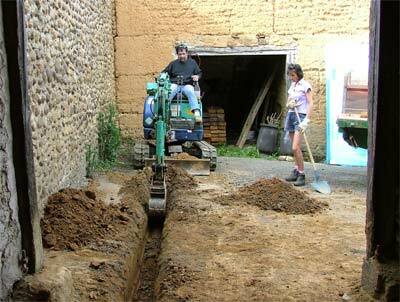 Using a small digger, our friend Pierre scraped out the top layer of soil and cement. 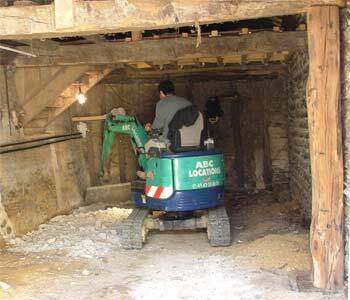 The soil went on our land, the cement went into the old, empty fosse septique. 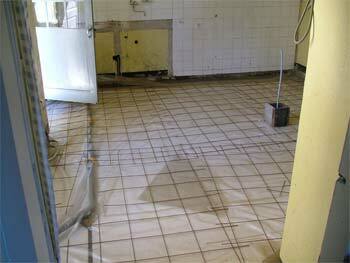 The floor is now low enough to fill with the cement and lay the parquet floor. 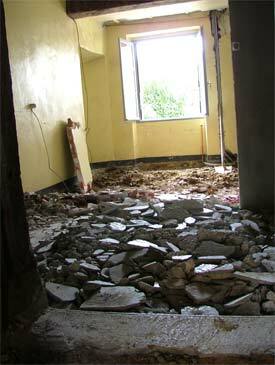 The stair will be remade to give through-access from the studio to Caroline's study upstairs. 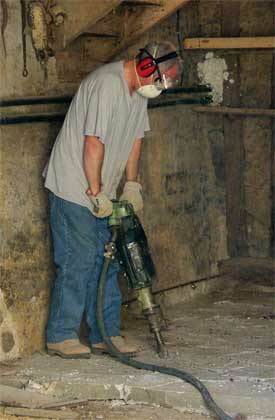 The cement floor was dug out with a pneumatic drill. The whole valley vibrated as the guys worked. A day later, the rubble was gone and the insulation, waterproofing and metal grill in place. This was followed by the electrician who ran his cables across the floor and walls. The box in the middle of the floor is to protect the gas and electrical feed for the cooking island that will be placed there, whilst the cement is being poured in. 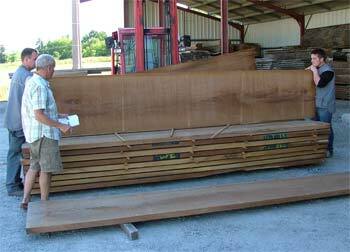 We visited several wood yards before we found the hardwood we wanted. Iroco is very hard and heavy. Perfect for the kitchen work surfaces once we oil it several times. It comes from Brazil. Caroline was very insistent that it was legally logged, but we can only take their word for it. All being well (yeah, right) we will be able to cook in the new kitchen in July. Keep your fingers crossed. We have had little delay in getting the right artisan on the job at the right time. Caroline's persuasive manner and our joke-a-minute routines seem to keep them coming back for more.